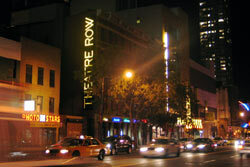 The Theater Row theater complex on 42nd St. in Manhattan. Photo by Eugene Hernandez/indieWIRE. Emerging Pictures will launch a new commercial art-house screen in Manhattan, the company announced Wednesday. The move marks a step in the outfit’s plans to develop a 400-screen digital theater chain at non-traditional art-house venues without the use of film projection. The company will base its New York venue at Off-Broadway complex, Theater Row on 42nd St. in Manhattan. Theater Row, a group of five stages in the Theater District of New York City, will dedicate one of its venues to “Emerging Cinemas at Theatre Row” for calendar programming that will present indie films, foreign films, docs, revivals and more. Theaters at Theater Row range in size from 88 seats to 199 seats. Depending on Theater Row’s live performance commitments, Emerging Pictures will shift to larger or smaller houses easily given the portability of its digital equipment. The Theater Row site includes a café and bar for audiences. The new venue will kick off with a run of the Emerging Pictures release, “Home of the Brave.” The film, by Paola di Florio, is a documentary about Viola Liuzzo, the only white woman killed during the U.S. civil rights movement. It premiered at Sundance earlier this year and debuted commercially in Detroit, with a run in Montgomery, AL set for October 15th.